In the final week of Lent we cover or remove the images and statues. Our churches and liturgies are so rich, so visual, we for a short time remove them to focus of saving act of Christ’s death on the cross. They too will return for the at the Easter vigil. We most profoundly experience the contrast over the Easter Triduum, one liturgy in three parts, the quiet reflective Maundy Thursday, the sorrowful and sparse Good Friday, and the joyful extravagance of the Easter Vigil. Do you remember, as a child, playing Cowboys and Indians or Princesses and Pirates. I used to run around the fields with a handmade bow pretending to be Robin Hood. It’s that leap of imagination that we can often lose as we grow up, it’s this imagination that we should try and kindle as we come to Church. We are embracing our Father and Saviour in the Mass. The tradition of our Church teaches us Christ is present at our Mass. He is present in the Eucharist, He is present in the Priest as he consecrates the Eucharist, He is present in the words of the Scripture as they are proclaimed, and he is present in each of us as we come to worship. We bow at other time to in our mass. We should all bow during the Creed, when we say the words “and by the Holy Spirit was incarnate of the Virgin Mary, and became man.” We bow in honour of the moment Christ came to us, became one of us, that moment of incarnation. This Holy Week, I ask you to embrace the penitential season. Think about what you do, what you see, what you say. Invest a little imagination in your worship and know that what you are heading towards is the joy of meeting Christ this Easter. The Passover meal is one of the biggest feasts of the year for the Jewish people. It is a time for the people of Israel to give thanks for their salvation. To remember the night they were saved from slaver. To remember how the Lord went through Egypt and passed over their houses. How the Lord struck down the first born of every Egyptian family and animal. There is a pattern here you might notice. We tonight gather to celebrate a meal, another Passover meal but not the original Passover meal celebrated by the Jewish people, but the Lord’s Supper, the last meal our Lord ate. Christ was celebrating with his friends, the disciples, the saving act of God in freeing His people from slavery under the Egyptians, as we here, are celebrating the saving act of God freeing us from slavery to sin. The nation of Israel was saved by the death of the first born sons of Egypt. We are all saved through the death of God’s first and only son, Jesus. Every time we take part in the Mass, every time we receive Christ’s body and blood, every time we join our heart to His during communion we also take a seat at Christ’s table at the last supper. We witness Jesus our Lord and Master wash the feet of his disciples. We see a powerful demonstration of the call to serve, the foundation of the priesthood, the foundation of our ministries and our service. The washing of feet was a servants job. It was also the act of welcome into a house. As Christ washed their feet he showed them they were servants, he also welcomed them into his house, into his fathers house. Will you take this image away with you and let it lead you to serve others? The disciples founded our church, what will you do? Who will you be welcoming into God’s house with your service? This Easter, this Triduum, open your heart to Christ. Stay and pray with Him tonight. Stand at the foot of His cross tomorrow. Joyously offer praise and glory to Him as His light returns to the World on Easter Sunday. Take Christ as your example, you are His disciples, you are His royal Priesthood, You are now the servant He is sending to a world that very much needs you to wash it’s feet. “It is accomplished" and bowing his head he gave up the spirit. Easter has been simplified and commercialised by the world around us. The rich history, the thousands of years of tradition, the mystery of Easter is lost, drowned out by bunnies, eggs and chocolate. Mystery is an interesting word; do you know what it means? Easter is divine revelation! Easter is God showing Himself to us! At Easter we join Christ as we celebrate his passion, death and resurrection. God is revealing to us a truth, a powerful truth, the single truth, Himself. Yesterday we met Christ at the last supper, we traveled with Him to the garden of Gethsemane, we waited with Him and prayed with Him and tried to stay awake with Him. Today we die with Him. Today is quiet day. A day to reflect on death.A day to reflect on our sin. A day to reflect on where we would be if Christ was not in our lives. Today we reflect on the great sacrifice Christ made for us. On the things in our lives that required Him to make that sacrifice for us. Today we die with Christ, we die to sin, we suffer with Him, we look to the crosses in our own lives that we must bear. Tomorrow we will see, know, and feel the full mystery, the revelation. But for now it is Christ’s death that is important. We call today Good Friday. I am often asked why it is good. It’s good because Christ, God’s Son, High Priest came to offer a permanent sacrifice for our sins. He needed to sacrifice something perfect; something so opposite to sin and the only thing that fitted that description was Himself. Christ took the role of High Priest and the role of sacrifice. He offered Himself for us. He gave up His life for his friends. The sin of Adam destroyed completely by the blood of Christ. Today is good because we know the end of the story; we know about the resurrection, we know about the difference Christ makes in our daily lives. But the Easter Triduum is about the journey with Christ, today on that journey we see the cross. The tree that Christ was nailed too, the tree that he was lifted up on for all to see, the tree he was slowly and painfully crucified on, the tree on which he died. Today is about joining Mary and John at the base of the cross and watching our Lord Jesus die, for us. 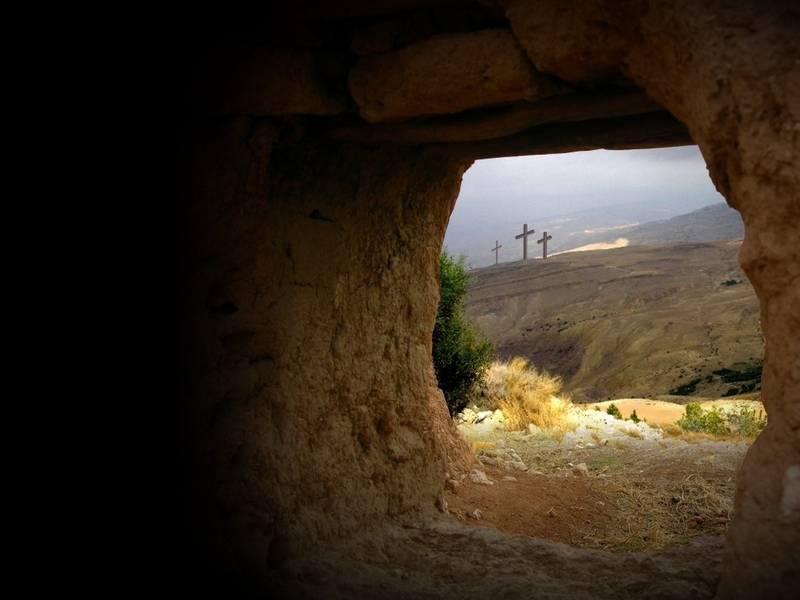 “He is not here; He has risen." Over the past three days we have journeyed with Christ. We ate with him at the last supper, we watched as he gave us the priesthood, washing our feet as an example of service. We eat His body and drank His blood, as He gave us himself to us, as the source and summit of our Christian lives, the Eucharist. We stood with Mary and John at the foot of the Cross. We watched as our high priest, our king, found the only perfect thing to sacrifice, himself, for our sin. We watched him die. We arrive now at the tomb, an empty tomb. We hear the words, “He is not here; He has risen.” Christ lives, Christ has defeated death, Christ's gift to us is life, eternal life, eternal life with him. Alleluia. I have missed that word over the last 40 days of lent. We have been saving up our Alleluia's so we can use lots of them tonight and over the next 50 days of Easter. Alleluia, it’s a Hebrew word and it means ‘Praise God’. It's a joyous word and it only sounds right if you smile while singing it. Tonight is a joyous time. Tonight is the high point of our liturgical year. Tonight we gathered outside, the family of God, drawn to the fire, a light in the darkness, keeping vigil for the light of Christ. Now inside the church, we welcome the light of Christ back into our world, into our church, into our lives. We filled this space with our salvation history, told through scripture. We heard how God spoke the world into existence, the word of God, Christ Jesus, through whom all things were created, right there at the start of everything. Isaiah calls all who are thirsty to seek the Lord, who is rich in forgiving. He reveals God’s promise to bring a leader to all the nations, a witness to all the peoples, a new and everlasting covenant. The promise of the Christ, the promise fulfilled in Jesus, His life, His Death and His resurrection. God revealed to us through Ezekiel another promise, that he would wash us clean, as each of us has been through the cleansing waters of baptism. With this washing, God promised us a new heart, a heart of flesh, a loving and feeling heart. A heart that is dead to sin, a heart that is alive for God in Christ Jesus. We know now that we have been saved, like the people of Israel being lead out of Egypt and through the Red Sea. We know our Lord and God travels with us as He travelled with Israel in that pillar of fire. The light of Christ burns in our pillar of fire, our Pascal candle, its flame divided as we entered the church, you each held the light of Christ in your hands, now let it burn in yours hearts.